Use on any grass type. Kills and protects against listed bugs. ants, armyworms, billbugs, chiggers, chinch bugs, crickets, fleas, grasshoppers, mole crickets, mealy bugs, sod webworms (lawn moth larvae), spiders, ticks, weevils. If Empty: Non-refillable container. Place in trash or offer for recycling if available. If partly filled, call your local solid waste agency for disposal instructions. Never place unused product down any indoor or outdoor drain. 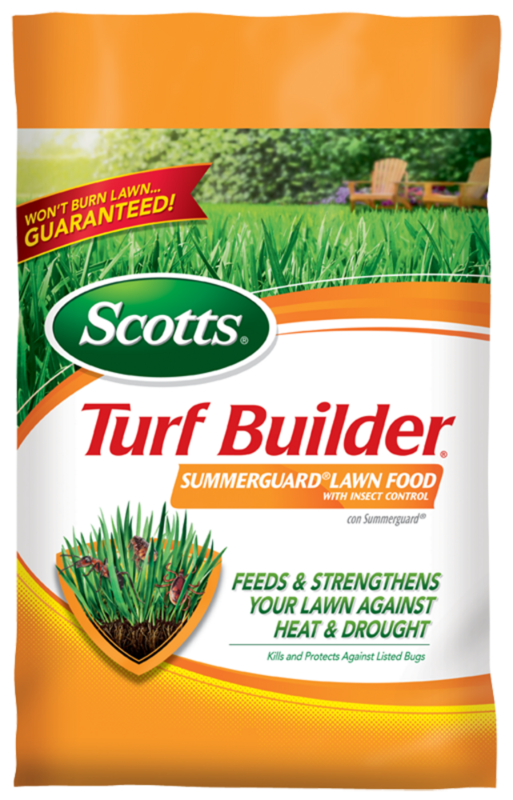 Insects are no match for Scotts Turf Builder SummerGuard Lawn Food with Insect Control. Protect against listed insects, including ants, ticks and fleas. First, regular feedings help your lawn look it’s best and provide the nutrients it needs to withstand the stresses of weeds, weather and activity. Secondly, after you mow leave the grass clippings on the lawn! This allows grass to use water more effectively. Finally, when you do have to water, do it between 6 and 10AM - less water is lost to evaporation and more reaches the roots.